Let the Fitzroy impress you the moment you walk in. 9-foot ceilings soar through the main floor of this Single Family detached home, and large windows let in plenty of natural light. You’ll be greeted by the flared staircase leading to the second floor, and beyond that, a formal dining room is on display. The decorative chandelier will add a subtle touch of elegance to every meal. 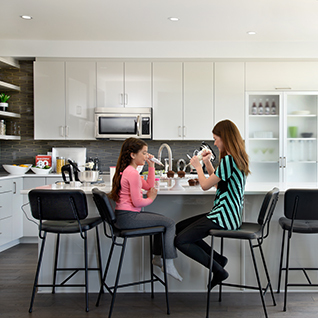 Bring the whole family into the open-concept kitchen. The white quartz oversized island has plenty of bar seating, perfect for a quick and casual breakfast or for keeping friends and family close by while preparing food. The dark grey quartz countertops are durable and complement the traditional shaker cabinets and intricately patterned mosaic backsplash. The mudroom off of the garage is the perfect place to unload groceries and kick off your shoes at the end of the day, and the powder room just around the corner is ideally located for a quick hair check before you head out in the morning. Gather in the great room — the heart of the Fitzroy — in the evening. The gas fireplace with a modern, limestone inspired ceramic surround commands the attention of the room. Tall windows on either side of the fireplace let light stream in and fill every corner of the room. Get cozy in the evenings with extra throws and a high-pile statement area rug. Let the brushed oak hardwood floors lead you upstairs where three large bedrooms and a spacious master bedroom await. A set of sliding barn doors is the star of the second floor and can be rolled back to reveal the perfect location for a home office or the personal library you’ve always dreamed of. At the end of the hall the master bedroom shines with his-and-hers walk-in closets. 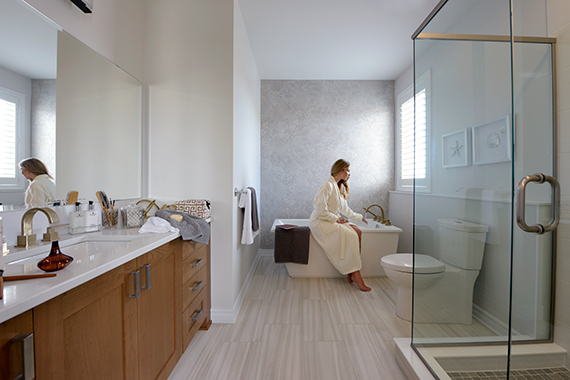 The master bedroom’s ensuite will quickly become your personal oasis. The shaker cabinets and white quartz countertop mimic the designs in the kitchen and truly unify the home from top to bottom. Step into your modern shower with glass doors and brushed gold accents or soak away the day in the deep freestanding tub. 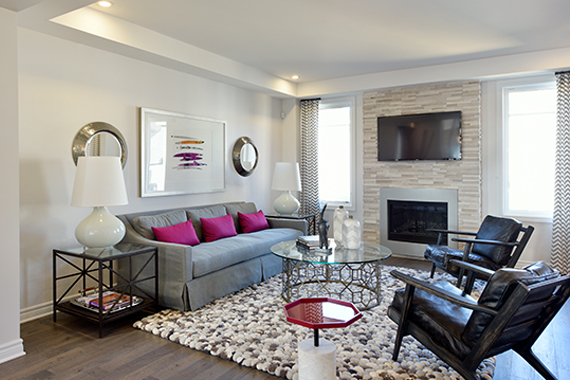 You can find the Fitzroy Model Home in Arcadia, Kanata. 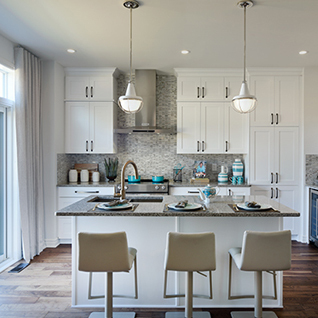 Visit our stunning collection of Single Family Model Homes in Arcadia in Kanata and Avalon Encore in Orléans and discover Minto's new designs for yourself. 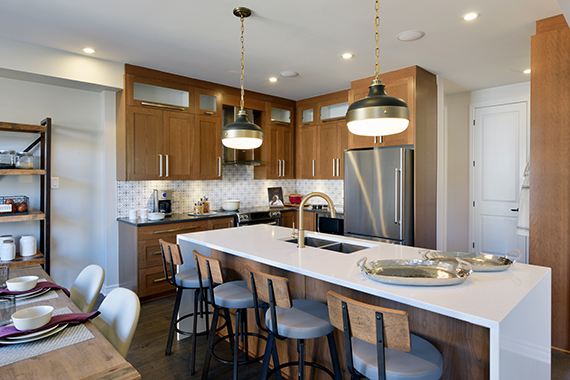 Finishes, flex plans, and décor described are unique to this Fitzroy Model Home, and may include features that are additional investments through the Minto Design Centre. Availability is subject to change without notice.